On the right is Mr Alfred King, headmaster of Handcross school from 1926 to 1936. By all accounts he was very keen on the more senior boys learning about gardening. Peter Arnold was a schoolboy at the time of this photograph and recalls his gardening memories in the book published to celebrate the 125th anniversary of the school in 2003. The Large Version shows a close up of the schoolboy gardeners with the silver spade. It appears to have an unusual design for the top of the handle. Back row: 3rd from left is my uncle, Bob Silverson, and 6th from left is Edward Boniface, sister to Edith, later to become Edie Boxall. Front row: 4th from left is Bob Pattenden. 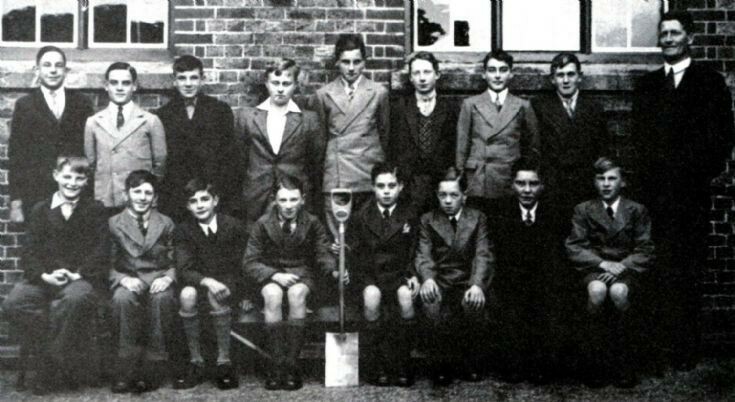 The boy holding the spade on the right is my father, Percy Glover. He is now 96 and lives in East Grinstead. Valerie, your father joined Handcross school on 26th April 1927 soon after his 5th birthday, and left "for employment" on 1st May 1936, aged 14. Barry, thank you for the information on my father's schooldays. In the front row, second from the left is my father, Ray Funnell, who then lived at Hoadlands on the Hyde estate.